So, flying with Malaysia Airlines on the 8th March 6 hours after flight MH370 went missing was ‘fun’! The smiles on the stewardess’ faces as we boarded the plan were not strained in the slightest! 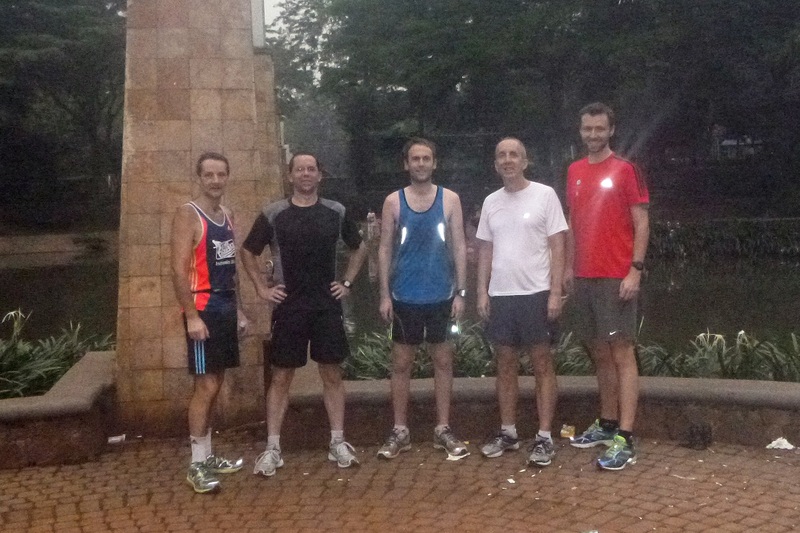 There were no organised runs in Jakarta while there (to be fair, I was only there for 2 days) and, well, there’s actually pretty much nothing to see in Jakarta other than traffic jams and smog so I was delighted to meet up with a local running group for a tour of residential Jakarta. 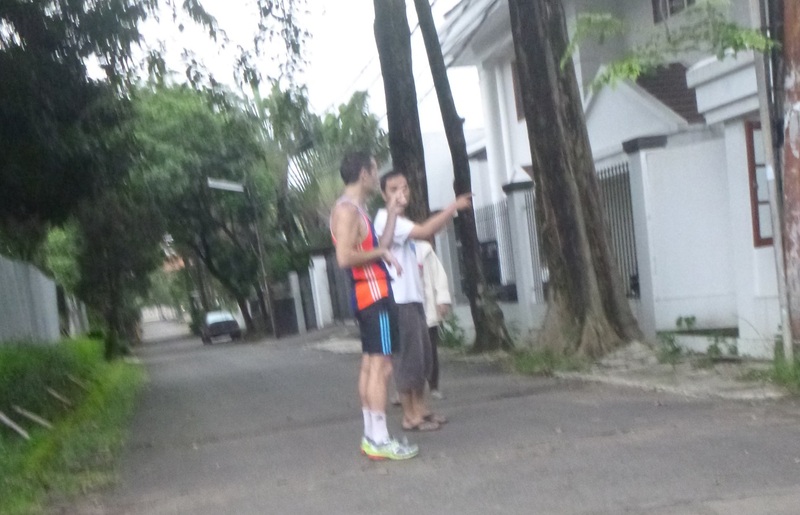 My (not very local) Indonesian running group! Tiernan, Brian, Mark, Sheldon and I started off from the ‘Grand Lucky’ supermarket in the financial district at 6am and headed towards, erm, well, I don’t know. I have literally no idea where we went! I couldn’t even say if it was south, north, east or west until I downloaded my GPS to my laptop. We went up a hill and that was about all that I could say! 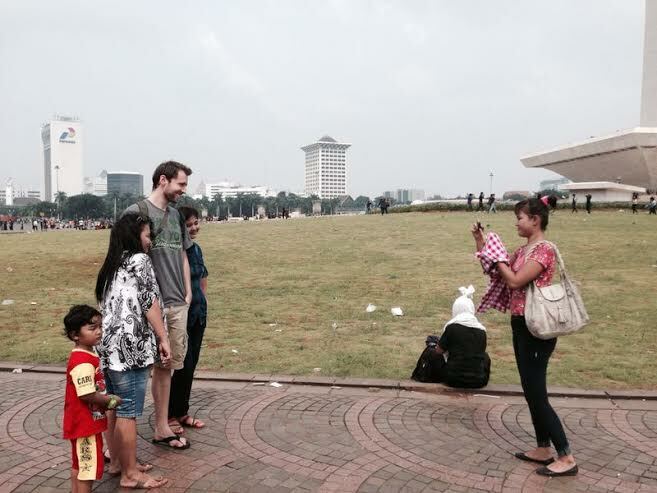 While I didn’t know where we went, the group did their best to give me a taste of what true life in Jakarta’s like which was really appreciated! I can’t say I left Jakarta thinking I’d want to live there but it was a great experience nonetheless! We zipped along (maybe ‘zipped’ is a bit of an exaggeration. We shuffled while sweating a lot) the back roads of Jakarta, going down some very small passage ways where locals live in probably over-crowded houses and a few decent houses which expats (well, their companies!) pay up $6,000 or more per month for. Based on my basic knowledge of economics, I think I could easily conclude that demand for decent houses exceeds supply in Jakarta! 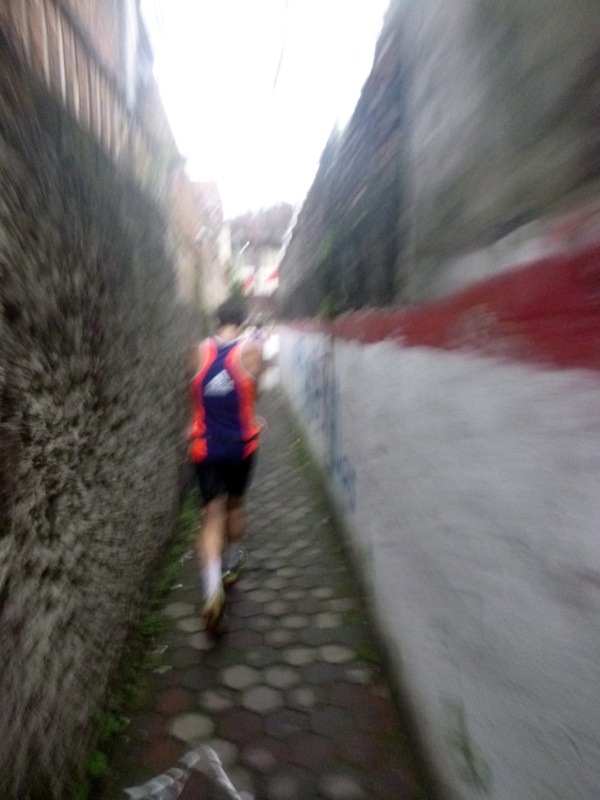 As we were pretty much running in a general direction rather than following a specific course, we ended up getting lost a few times which added a bit of spice to the run! 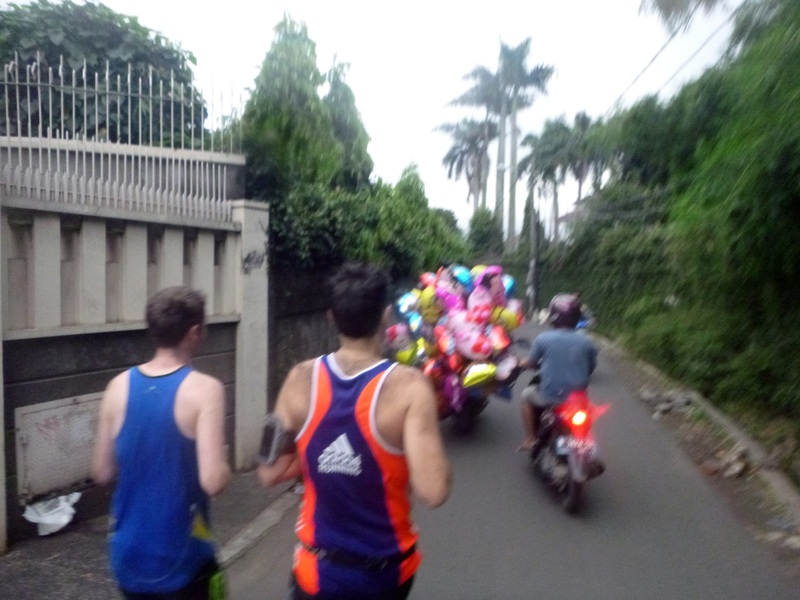 Some of the amusing scenes we ran past included big groups of middle-aged women doing their aerobics in the street, tons of kids playing badminton (also in the street) and cats with broken tails (also in the streets, and some trees). 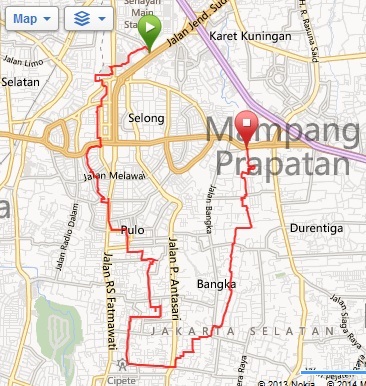 Some of Jakarta’s back roads! 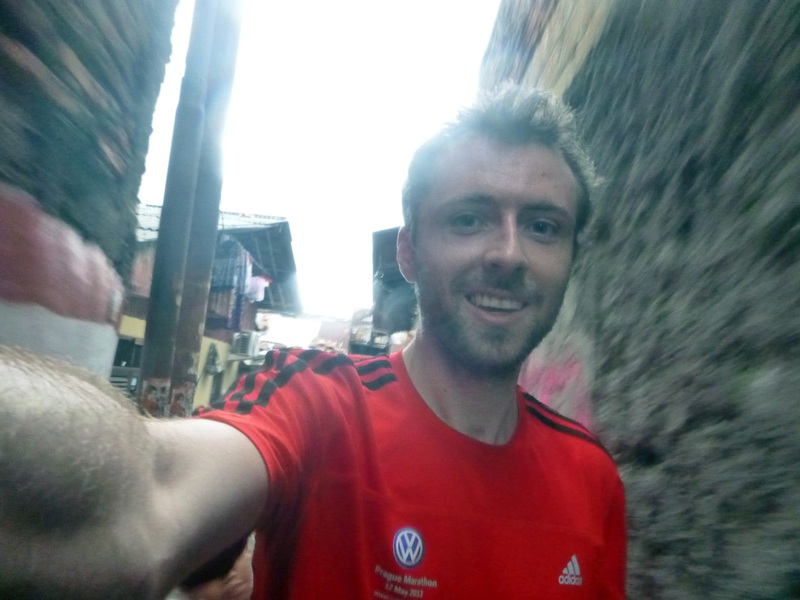 The run was far from fast, although that wasn’t its purpose: aside from the hills and the heat, the air was thicker that in an airport smoking lounge and smog certainly doesn’t make you run quickly! Just before a big storm drew in, we wheezed our way to the end and I grabbed a £1 taxi back home for a healthy breakfast: a 5.15am rise for 10 mile run followed by carrot and orange juice, I’m starting to resemble Calvin’s Dad in Calvin & Hobbes! On a final side note, maybe my fame has been traveling faster than I thought as a fair few locals kept stopping us in the street to have photos taken with us!